Well that was a busy month! 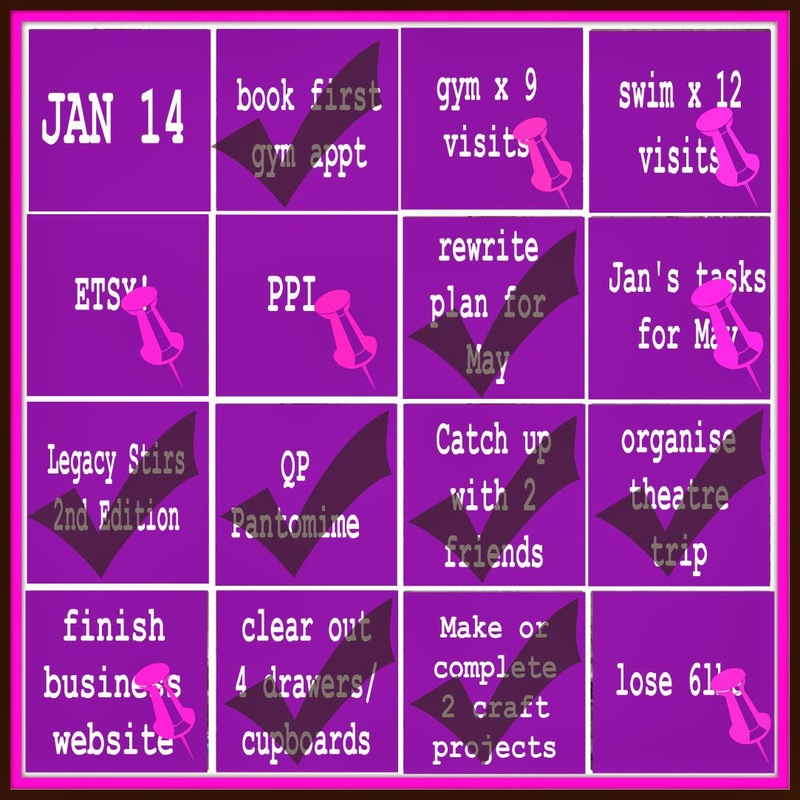 ETSY and PPI were a complete fail - better put them on February's goals! Rewrote what I need to get done before the do in May - and started wading through the list! Eeek, it's a long list! Have created a second edition of Legacy Stirs and taking it down from Amazon for a while whilst I decide what to do with it! Went to see Wind in the Willows at the Quince Players, and raised money for Martha in the process. Caught up with more than 2 friends. Went to see Mandela with Dawn. Lou and Mark popped in for lunch. Went to Frankie & Benny's with Ariane. And Jeanette came round for a couple of hours and helped me stress about all the stuff I've got to get done for May! Booked trip to Windsor Theatre to see Cats - never seen it! And haven't lost so much as one sodding pound! Was quite despondent as I have been so active and eating healthily. And, FYI, if you ever have a friend in a similar situation, telling them that muscle weighs more than fat does not help!! Also ...... Jeff was quite rough - had his first sick days in 13 years! So must have been feeling really bad! Small front room is filling up with stuff for May - exciting but messy! Got to see Joshua play only one match this month - yep, rain has halted play .... a lot! Extra on the gym - that's great! And you will enjoy Cats. Excellent play. Hey the last time I religiously worked out & dieted i went up 2 pants sizes. Discouraged, I vowed to never go back the gym again. I hope you enjoy Cats. Many years ago in college, a bunch of us paid for tickets and a charter to take us to NYC to see Cats on Broadway. The morning of the trip, we had a huge snowstorm (I was in Maine) and the trip was canceled. When I went to get the money back from the organizer, he put me off for months before finally coughing it up. I now realize that he probably used the money on something else and was praising jesus that we happened to have a snowstorm that day so he wouldn't have to come up with a reason why we couldn't go. He never refunded anyone else's money but mine b/c I wouldn't let up. Argh don't say that JoJo, I think I would cry, I'm trying to improve for our do in May, my figure doesn't need much help to look worse LOL! You will enjoy Cats I'm sure. I saw it a few years ago. I am getting to see Lion King later this year and Phantom of the Opera (which I have seen before but am excited to see again) Love a trip to the theatre. Well done with all your achievements for January, hope February is a good month for you. You must have lots of energy doing all that. I wish I could have fitted a tenth of all that into my January. I still haven't managed to get back into my routine since Christmas - life keeps happening!